China’s new climate diplomacy could make a major contribution to a future climate pact, but a global agreement in Paris will likely be general outlines rather than a detailed deal. The engagement of China and the US has been a major breakthrough in international climate change negotiations and has set the stage for a successful outcome at talks in Paris in December, according to climate experts. 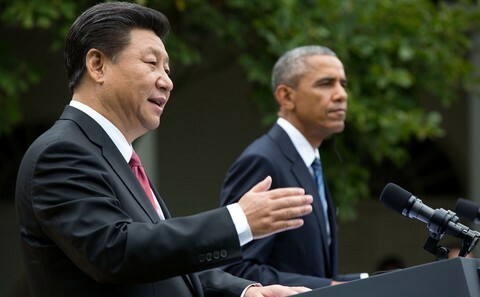 Presidents Xi Jinping and Barack Obama demonstrated game-changing political will by pledging to tackle emissions at the Asia Pacific Economic Cooperation (APEC) Summit in Beijing last year, a panel convened by website Climate Home, E3G and consultancy PwC told a press conference in London on Thursday. “You would not have had a US-China agreement unless the two countries were really clear about where they wanted to go and had the conviction to get there,” said panelist Pete Ogden, a former director for climate change and environment policy at the White House. High-level conversations between the world’s two biggest greenhouse gas (GHG) emitters also indicate a willingness to move on from past failures. Expectations were high in Copenhagen in 2009 but hopes of finalizing a meaningful deal covering all parties broke down amid well-established divisions between rich and poor countries. But all countries are now taking ownership of climate policies by setting emissions reductions targets nationally in advance of negotiations in Paris (COP21), the panel said. France’s diplomat responsible for COP21, Laurence Tubiana, suggested that bilateral climate announcements, agreed ahead of countries national climate plans (known as INDCs) indicated newly-engaged countries were making more effort “to understand the tone” of their counterparts. “China is now less defensive and more inviting, it is trying to take on a leadership role,” said Tubiana, referring to joint climate agreements with Brazil, as well as the US. But, despite renewed optimism on diplomacy, the 122 INDCs submitted to the UN so far still fall short of meeting the emission reductions required to limit global temperature rises to 2C this century, according to Climate Action Tracker. A 2C rise is the point at which scientists from the Intergovernmental Panel on Climate Change (IPCC) predict “catastrophic” climate change. Tubiana said she hopes Paris will represent a turning point, after which enduring low-carbon economies will represent “the new normal”. But, she also warned, the real work of implementing and monitoring national pledges would begin in earnest after the talks. Monica Araya, a former Costa Rican climate negotiator and director of Nivela.org, said that countries would set about closing the gap between pledges and the commitments needed to meet the 2C target in January once the dust from COP21 had settled. “Each country that is serious about this has to start saying ‘this is our INDC, it’s not enough and we know that, and this is how we go about bridging what we have on the table and what we know we should have’,” Araya said. Araya also challenged the usefulness of applying the term ‘developing’ to a diverse array of countries that are responding to climate change in innovative ways. “The fact that we are labelled poor countries and we need aid is the most disempowering idea. It’s very disrespectful to be told that you have to stick to the narrative of asking for money,” she added. Another way Paris will differ from Copenhagen is it will involve political leaders from the outset. Tubiana conceded that when presidents and prime ministers arrived at the end of the summit in Copenhagen it was “too late”. France hoped to learn from that experience. Former Indian environment minister Jairam Ramesh described France’s plan to invite national leaders to the opening of COP21, as a “major innovation”. It should allow the crucial political aspects of the agreement to be reached early on, with negotiators then ironing out the details.